MPS is all about what and how your office prints on the printers that reside in your office(s). MPS is all about getting your arms around your office’s entire printer fleet, providing tools to monitor and manage your devices, deliver supplies, and offer optional, on-site service to keep your devices up and running. 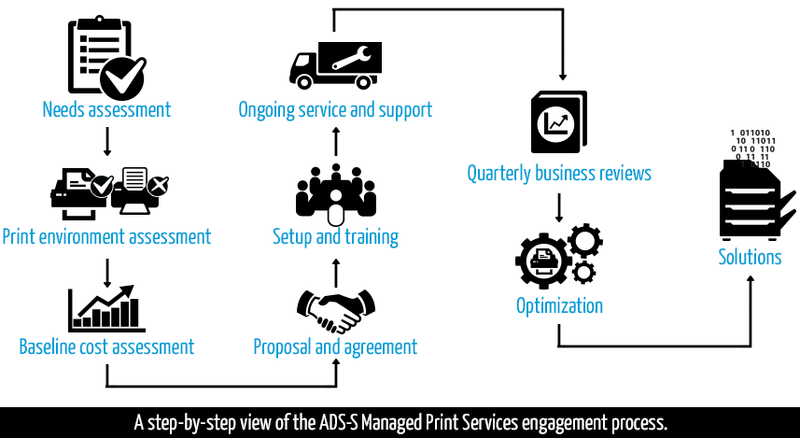 ads-s offers all this and more while still producing a significant savings to your organization. MPS is highly customizable with a variety of services available that allow both large and small businesses to streamline total document production and business processes. This solution covers all aspects including supplies, service and the printers themselves; resulting in increased profits and employee productivity. The benefits are abundant because MPS allows your business to have complete visibility of your printing environment and allocate their resources more efficiently. For the first time, you will have the ability to see all of your costs associated with printing in one easy place. No more guesswork and uninformed decisions. As print, copier, and fax devices become more complex, you can trust ads-s to be your go-to for support and solutions. We give you a comprehensive analysis with an emphasis on helping you spend less. At ads-s, we work with you to make sure your current devices are in the right place for the right application at the right volume. Printing is now the single largest unaudited business expense. According to industry experts, by the year 2013, it is expected that over 50% of multi-function print devices will be managed under this type of contract. Why? Because printing costs are out of control and rising. With our robust software and web interface, you will have 100% visibility of your entire print fleet, in real time, on one screen. Customizable reports can be downloaded in seconds and converted to an Excel file for manipulating and analyzing. With this data, you are better prepared to make informed decisions on re-deploying and upgrading your fleet.